Information about the organization and evolution of plastomes is crucial to improve crop plants and to resolve the phylogeny of photosynthetic organisms. 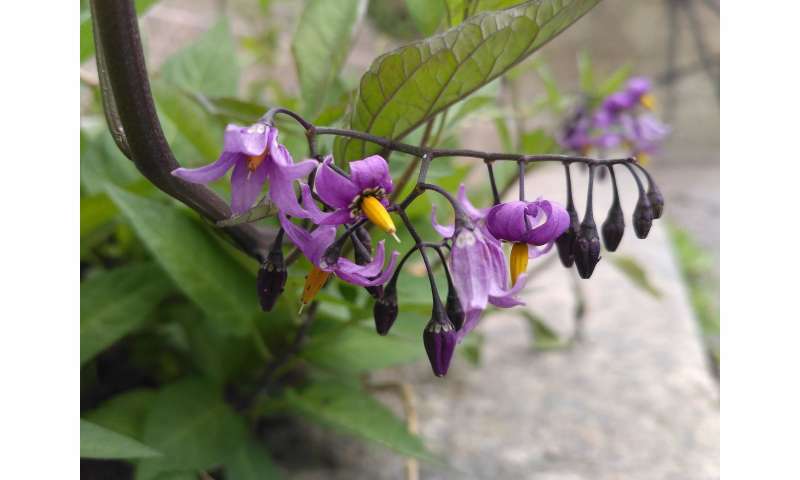 In a recent study researchers of the Finnish Museum of Natural History, University of Helsinki, sequenced the plastid genome of a weed called bittersweet (Solanum dulcamara). The first complete plastome nucleotide sequence was published in 1986 for tobacco (Nicotiana tabacum L.) of the nightshade family (Solanaceae). This economically important mega-diverse plant family contains well-known crops and ornamentals such as potato, tomato, eggplants and petunias. In the study published in PLoS ONE researchers of the Finnish Museum of Natural History (LUOMUS) of the University of Helsinki sequenced the plastid genome of bittersweet (Solanum dulcamara L.) to provide genomic resources for chloroplast engineering. It is a diploid weed commonly found also in Finland, and has resistance to most important potato disease late blight caused by a water mold (oomycete) Phytophthora infestans. "When we tried to compare the bittersweet plastome to other nightshade species we realized it cannot be done properly since genome annotations seem to contain so many errors," says the leader of the research Péter Poczai. The study showed for the first time that these errors are due to one simple outdated software used worldwide. As a consequence, these errors are copied and propagated from one sequence to another in genetic databases. "With hard work and manual editing we have corrected these errors for all solanaceous genomes, which place the bittersweet as a model for nightshade chloroplast comparative genomics. The wake of the errors in annotation is alive in plastid genomics in general since most of the sequencing projects are using this outdated software, which we are convinced needs to be replaced with a more advanced tool already planned as our next cutting-edge project," Ali Amiryousefi, Ph.D. student in LUOMUS and first author of the study adds. Only after these improvements, the LUOMUS group was finally able to make the comparative analysis of all nightshade plastid genomes, where they present hypothesis of the ancestral genome. With this they were able to show that structural re-arrangements are coinciding with bigger evolutionary changes of this family. The plastid genome sequence of the common weed bittersweet will help in benchmarking nightshade plastid genome annotations and could be used as a reliable reference in further studies. "The present study is part of our research using the living greenhouse and herbarium collections of LUOMUS for sequencing chloroplast genomes and investigating the diversity of flowering plants. So far, we have sequenced 30 plastid genomes from our collections and first results are now starting to be published" summarizes Poczai.